Granta, for those who don’t know it, is an English quarterly which publishes such luminaries as Lessing, Theroux, McEwan and Winterson. The editor of this issue, Jason Cowley, takes as his theme the notion that ‘economic migration, overpopulation and climate change are transforming the natural world into something unfamiliar,’ changing the way we interpret nature. 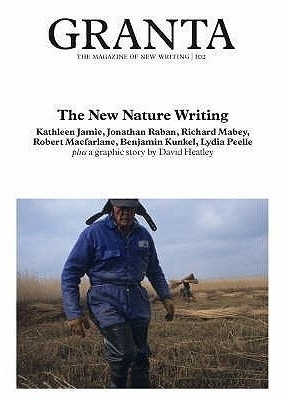 Cowley’s definition of ‘nature writing’ is broad enough to include squatters in the Bronx, children growing up in a 1960s Liverpool housing estate, and the demolition of the Maze prison in Northern Ireland. The last of these is a photo essay, and complements a group of superb photographs of farmers in the fen country of Norfolk. One of the best of the oddities is Kathleen Jamie’s exploration, via pathology lab and microscope, of the natural world inside our bodies – bacteria grazing on the stomach lining, ‘like musk oxen on tundra,’ and more troubling sights. More conventionally, Jonathan Raban and Benjamin Kunkel explore the interplay between man and nature in middle America, and Edward Platt elucidates the interplay between military aircraft and migratory birds in Israel. Seamus Heaney (and it’s a sign of the collection’s quality that a Nobel laureate comes so far down the list) and Richard Mabey contribute smaller, quirkier pieces of British natural history. The common factor is sharp observation rendered in crisp, stylish prose. At 260 pages, The New Nature Writing is a very solid anthology both physically and figuratively. It does not set out to be life-changing but will bring readers a lot of quiet pleasure. • Reviewed at publication time for the Townsville Bulletin and republished here because it still comes up in my conversations about books and the environment.